The May issue of Bon Appetite was a bit of a let down after April’s Italian issue (LOVE at first sight), and I initially found the recipes a tad on the dull side. However I could not have been more wrong in my initial assessment, and I’m happy that my habit of opening a BA whenever i’m bored lead me to reconsider this issue. Back to my initial query though; Do you like Sriracha??? This is a very important question because it could mean the difference between a tear soaked napkin or taste bud bliss. The reason I ask is because today’s dish of Grilled Tofu is heavy on the fiery red sauce and could injure the taste buds of less spice loving folk. Korean Fusion is much the rage here in LA LA land and I wanted to try my hand at it. That being said this dish wasn’t too fusiony (real word?) because everything involved was Asian if not strictly Korean, but it was delicious all the same. The tofu had a great texture from grilling; the Sriracha, soy, and Miso paste used to flavor the dish was unexpectedly mellow for being 7/8 Sriracha based; and the flavors permeated the tofu to the core so there was no bland bean curd to be had. Also curiously enough this is another fabulous vegan dish and i’m beginning to convince myself that Vegans lead a life not entirely devoid of good food. So off to the kitchen Sriracha lovers and rejoice in the fabulously hot flavors of rooster sauce. 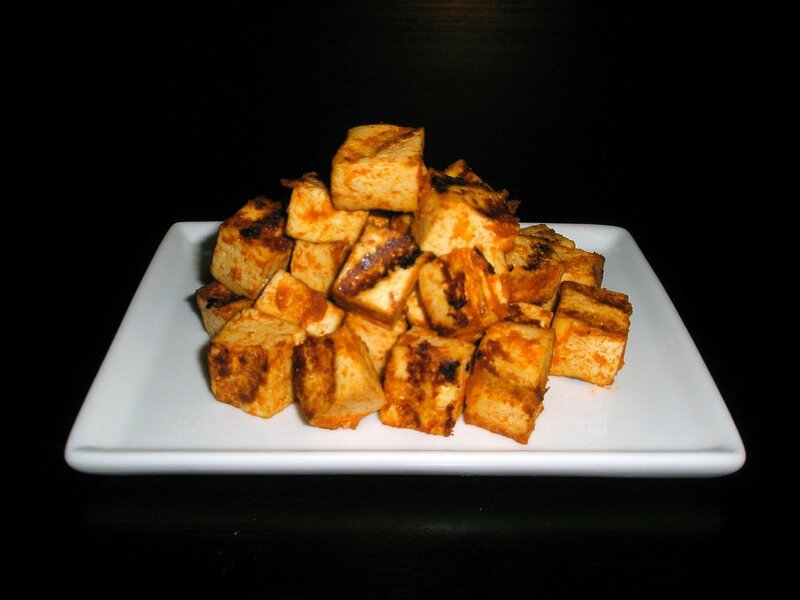 To press tofu: Line a shallow bowl or rimmed plate with two layers of paper towels. Place the tofu block on top and press down with two more sheets of towels. Remove top sheets of towels and replace with two more, then place a brick or bowl full of water on top and allow to rest on the tofu for 15 min. more. Once time is up, remove tofu from towels and slice into one inch blocks. For paste: Combine remaining ingredients in blender and pulse until a smooth paste forms. Pour over tofu, cover and refrigerate for three hours or overnight. Shake off extra sauce and grill on med heat turning every few min until tofu has grill marks and is heated through. Posted in fast, main dish, vegetarian. Tagged garlic, miso, scallion, sesame, soy sauce, sriracha, tofu.